Scroll down to see all water slide rentals & click on the title or image for more info & online ordering. When it comes to party attractions, an inflatable water slide is tough to beat! Our selection of inflatable water slides and pools allows your guests to beat the heat via an exciting and refreshing state-of-the-art party rental! 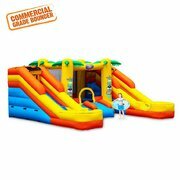 Check out our collection of water slides below, and find the perfect addition to your next party or event in Mississippi! 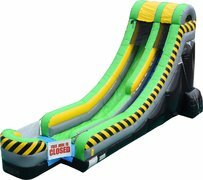 For a truly memorable event, consider adding one of our oversized water slide units such as the 30 foot Slip-N-Slide, the 18-foot Tropical Fiesta Breeze Slide, and the 30 foot Lava Rush Water Slide! 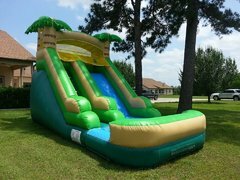 Perfect for those hot summer months and all sorts of backyard events, a water slide from North Mississippi Party Rentals is the perfect way to introduce a splash of excitement and hours of fun to your upcoming event. Make your reservation today!